What is it that we are really afraid of? When I was in eighth grade I took a placement test and was switched into an advanced math class. The move meant that I changed out of the regular track, where the majority of other students of color were, and into the accelerated track, in which there were few students of color and almost no Black students. My friends, most of whom remained in the standard track, teased me for months about the switch, making all kinds of allusions to my being stuck up, sold out, and generally questioning my affinity to the community. When I spoke to adult figures about the issue, most of them ignored my friends’ comments, and advised me to stay focused on my studies. “Black is as Black does,” and “There is more than one way to be Black,” were common refrains, as was the accusation that my friends were holding themselves back by limiting their definition of Blackness to one of failure, instead of pushing themselves in the way I was. This memory has reemerged recently as I have overheard many debates amongst scholars, talking heads and friends about the idea of “post-Blackness.” The foundation of the theory, as it has been put forward by academics like Skip Gates and Toure, matches almost exactly the things I was told as an eighth grader: There are as many ways to be Black as there are people who identify themselves as such, and we are now (suddenly) in an era in which we as Black people have the ability to liberate ourselves from a definition of Blackness which stifles, stultifies and limits our human potential. Like so much seductive rhetoric, this simple statement seems benign, and there are large parts of it that I think most of us would agree with. What interests and worries me, however, is who specifically is invested in this idea of post-Blackness, and why they propose it as such an important concept. 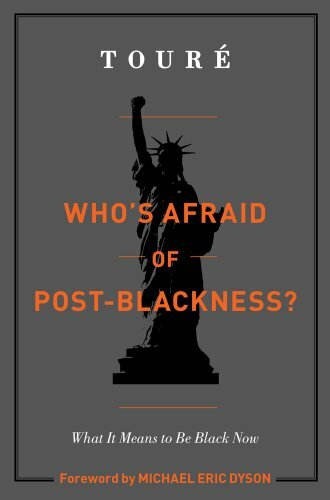 That it is primarily academics, celebrities and public intellectuals that seem most interested in the idea of post-Blackness is not, I think, coincidental. That they often describe the stifling definition of Blackness they feel confined by as being imposed on them most frequently by other Black people is also important to note. The claim that we should “liberate” ourselves from old requirements–which many of these scholars argue were forced on us originally by white society–when examined more thoroughly, seems to be another excuse to attack poor and working-class Black people for the dire straits that they have put themselves in. If only we would stop defining Blackness as a form of failure (an interesting premise in and of itself) and learn to expand our definition to include a wider range of perspectives and experiences, these figures say, we might be able to grow as individuals, and lift ourselves out of so many of the difficult spots we find ourselves in. The same scholars that profit post-Blackness tend to scoff at the ludicrousness of the concept of a post-race society. Yet what I think these scholars fail to grasp are the ways in which the ideas of post-blackness and post-race are fundamentally tied: Both see race through the lens of the individual, linking its current role in our social orders to individual identities and isolated interactions between individual people. This approach, which might lead one to any number of misinformed conclusions, fails to comprehend racial categories as maintaining historical reasons for being constructed and continuing to exist, and to contemplate race as working amongst groups, communities, systems and institutions to shape our world and the disenfranchisement of so many people within it. These thinkers state that there are as many ways to be Black as there are Black people. Yet the underlying concern seems rarely to be that we should understand Blackness as something wide and complex, and far more often that we defend the right of individuals to participate in the institutions and systems they want to, even if those systems benefit their individual persons at the expense of the wellbeing of the majority of other Black folks. Ultimately, Blackness as an identity which unites communities in the face of these systems seems to be the true constraint against which proponents of post-Blackness are chafing. I believe that as an eighth grader, I could have understood my friends’ taunts, while hurtful, as being my community’s way of checking my active participation in the hierarchical and inequitable structure of school, using it to garner privilege for myself, even as the same structure labeled and inhibited my friends from gaining the knowledge and opportunities they needed to grow. This understanding, though it may not change the harsh ways in which I was at times treated, does change what that treatment meant, the places it came from, and what I as a young Black educator might learn from it now. For so many of the ways in which we as oppressed people check and screen one another for authenticity, while damaging and ineffective, are born, I still believe, out of a concern for the survival of our communities, and a recognition of the values, powers and institutions which have historically threatened them. And while I agree with many of my people that we need to find better ways of forging and maintaining our communities than through cultural policing and intimidation, I also think using this fact as a guise to justify the participation of individuals in structures which disempower all people is not the direction in which to move. I am not interested in rigid and externally imposed definitions of Blackness, queerness, or any of my other sacred identities. I am not invested in definitions of community which divide, deride and privilege certain sectors over others. But I am dedicated to solidarity and allyship. I am interested in structuring our communities in ways which unite them in resistance to unjust and oppressive orders, including capitalism, colonialism, the state and the academy. And while I believe we each have the right to define ourselves and our relationships to our people for ourselves, I also believe that what our commitment to those people consists of is a crucial and unavoidable question. And if certain members of our community would listen more carefully to the critiques they receive from others, they might find they are hearing the voices of struggle in ways they were unable to before. ← Vote For Nobody: Or; Is Participating in a Defunct Democracy Worth the Trouble?